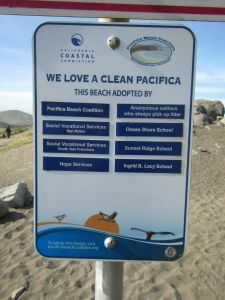 The Pacific Beach Coalition, in partnership with the California Coastal Commission, coordinates the Adopt-A-Beach program at six sites along the San Mateo County coast. As one of our most popular field programs, it is a great way for individuals, organizations, businesses, schools, or community groups to “take action” and engage in hands-on experiential learning that protects and preserves our beaches. WHO: Individuals, groups or families can choose to adopt any of our 7 beach sites: four sites (Linda Mar, Rockaway, Sharp Park, Esplanade) in Pacifica; one at city line in Daly City at Mussel Rock; one at Montara state beach in Montara, and one at Pillar Point Harbor in Half Moon Bay. WHEN: Participants schedule their desired regular cleanup time with us to ensure the timeslot and beach site is available. Adoptees commit to cleaning their beach at least three times a year, although school groups can fulfill their obligation with a single cleanup. Everyone is encouraged to re-adopt at the end of the year. When a commitment is demonstrated, your name or the group’s name appears on on-site signage. WHY: The Adopt-A-Beach program fosters pride and ownership as volunteer Earth Heroes begin to care for and steward “their” beach. The Pacific Beach Coalition provides cleanup supplies, orientation/training and a brief marine debris presentation prior to your first scheduled cleanup. HOW: For more information, or to sign up to join for our Adopt-A-Beach program, contact us directly. If you love a beach that is not already part of our monthly Adopt-A-Beach Program, we invite you to become a site captain for the Pacific Beach Coalition. You will have a few responsibilities such as promoting your cleanup (with the help of our marketing and communication team), instructing volunteers during the cleanup, overseeing data collection and debris disposal, storing your beach cleanup supplies and participating in our meetings. Our team of veteran site captains will, of course, train you and provide assistance for a few cleanups until you get more comfortable. If you are interested, please send us an email at info[at]pacificbeachcoalition.org or contact us via our online form. Remember that the data collected about debris at your beach will help spread the message about the dangers of litter in the marine environment. 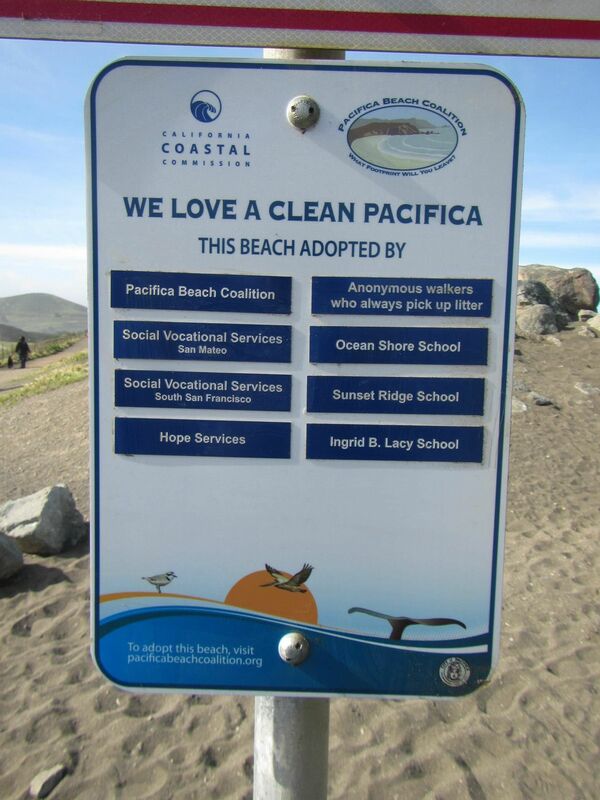 The Pacific Beach Coalition coordinates the Adopt-A-Beach program in San Mateo County. Sign up today to adopt a site of your choice and conduct cleanups based on your schedule! When a group “adopts” a beach, they commit to cleaning it at least three times per year, although school groups can fulfill their obligation with a single cleanup. Don’t have the time to commit to adopting your own beach? Join our site captains at one of our monthly scheduled cleanups. Or if you have a large group, contact us and we can set you up with materials and a site in need of cleaning! Please read through the Cleanup Guidelines to be prepared to participate in a cleanup. We like to hear from Earth Heroes inspired to cleanup at the beach or other sites along the coast. If the weekends don’t work for your group, we would be more than happy to find another date that would work for you and our volunteer site captains. Make sure to send us an email at info[at]pacificbeachcoalition.org or via our contact form.